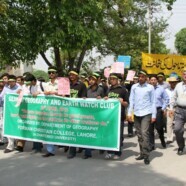 FCC faculty, staff and students collected for Earth Day Walk on 25 April 2012 organized by Earth Watch Club and Dean Geography Society. The purpose of this walk was to spread awareness of environmental issues faced by Pakistan and encourage people to help overcome them. The walk started from the Ahmad Saeed Administration Building covering the whole campus. Students participated with placards, posters and banners promoting the preservation of environment. Dr Manzur Gill (Advisor Earth Watch Club) appreciated the effort of the students to make the community aware of issues faced by Pakistan and the world at large. He also appreciated everybody who had joined the walk for showing solidarity for a cause which can make Earth a better place to live for the generations to come.